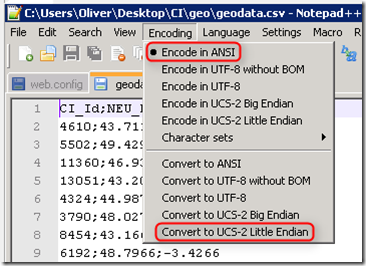 Well, the UCS-2 Little Endian encoding is what SQL Server expects as default encoding, so I changed the encoding, saved the file and imported it again – with success. UCS-2 might be something you rarely hear about – that’s because it’s been superseded by UTF-16 but in most situations they are pretty much identical (check out http://en.wikipedia.org/wiki/UTF-16/UCS-2 for more info). That’s all for now – happy coding! You saved my day. I was trying to upload a comma separated one record file with CRLF and getting the same error. I was surprised because everything was perfect and BULK INSERT was working fine with the same file. I googled so many articles but no clue. Then this article helped me. After saving the file in ANSI format everything started working!!! THANK YOU!